This year, 2016, is the 100th anniversary of the election of the first woman to the US Congress. 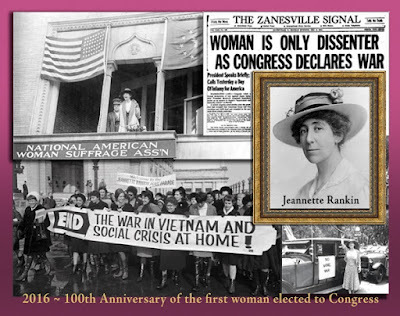 Jeannette Rankin, whose father was Scottish-Canadian, was elected in 1916 to one of the at-large seats in Montana. Shortly after her term began, there was a vote on whether the US should enter the First World War. She was one of 50 who voted against it but she took the greatest criticism around the country. Her seat disappeared in a redistribution and she was unsuccessful in a run for the Senate but in 1940, she ran again and won. Following the attack on Pearl Harbor, there was a vote on whether the country should declare war on Japan and once again, she voted against war. This time, she was the only dissenter. Her colleagues asked her to change her vote, to make it unanimous, or at least to abstain. She refused. "As a woman I can't go to war," she said, "and I refuse to send anyone else." She was vilified for this vote. She was hissed from the gallery and pursued by reporters into a cloakroom where she had to take refuge in a phone booth until police could rescue her. Two days later, there was a vote on whether to declare war on Germany and Italy and she voted against that one too. By that time, she was very unpopular and she decided to retire from the House. I first saw her in Washington DC on a visit to the United States Capitol's Statuary Hall. The inscription on this statue says, "I cannot vote for war." I knew little about her then but I've since read a lot about her and have come to admire her greatly. Besides her terms in Congress, she spent many years working on pacifist, feminist and civil rights causes – including getting the vote for women. 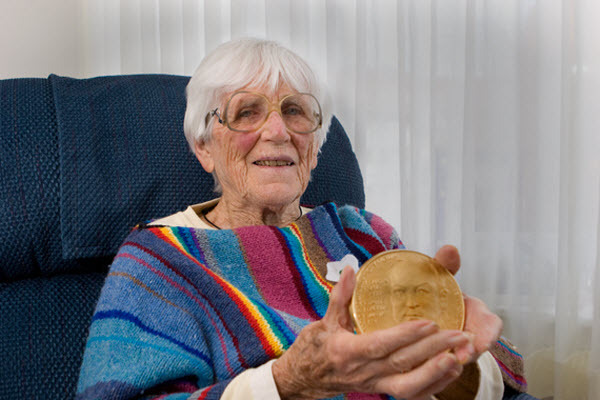 In fact, [a]lthough her legacy rests almost entirely on her pacifism, Rankin told the Montana Constitutional Convention in 1972 that she would have preferred otherwise. "If I am remembered for no other act," she said, "I want to be remembered as the only woman who ever voted to give women the right to vote." Years after her political action when she was asked if she ever regretted her votes against entering the wars, she said, "Never. If you're against war, you're against war regardless of what happens. It's a wrong method of trying to settle a dispute." I don’t think people recognize that war is the greatest destroyer of human life, the greatest polluter, the greatest creator of refugees, the greatest cause of starvation and illness. I've just posted a piece about Muriel that was first published in The Women's Almanac in 1993. It's called Muriel, in her own words and I invite you to drop over and have a look. And I have a postscipt: back in the 1980s when we still had and were members of the Red Herring bookstore, our main kitchen calendar every year was the Peace Calendar. We got it at Red Herring! When the bookstore was gone, we lost track and we began to use other and varied calendars. For awhile, we used the lovely CBC calendar which featured local artists' work. This year, Dan looked around and found the source of the Peace Calendar, sent away for it and once again, it's in the calendar place of honour in our kitchen. It's got the kind of daily references that other calendars don't have, it's got lots of space for writing in appointments, and its monthly picture is always something of interest. This month? March 2016? Why, it's Jeannette Rankin. I can't tell you how pleased I was to see her again.